Healthy breathing is a powerful tool. It has a direct affect on our stress levels. When we are in danger our body responds with restricted breathing through shorter and shallower breaths situated more in the upper chest. Our body’s automatic response to a threat is to prepare to fight or run. Adrenaline courses through out bloodstreams, digestion slows and energy is diverted to our muscles. If we continue to breathe shallowly after the danger has passed, through habit or in response to ongoing stress, we deprive ourselves of a return to a fully relaxed state. We alter our body’s response to stress through our breathing. 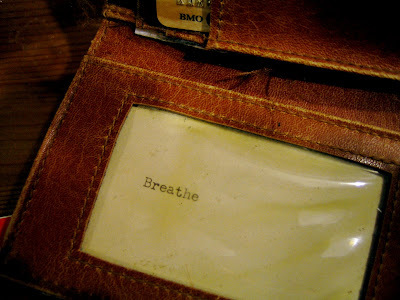 Today, pay attention to your breathing. Place one hand on your upper abdomen, the other on your chest. Take a full, deep breath in and notice whether your abdomen rises. Take 2-3 tummy breaths, 12-15 times per day: when you wake up, before and after you eat, when waiting in a line, at red lights, when you look at the time, during TV commercials, when you’re feeling frustrated or angry or bored or unhappy. To relax your autonomic nervous system: lengthen your exhalations and shorten your inhalations: inhale (count 1, 2, 3) and exhale (count 1, 2, 3, 4, 5). Find your own best rhythm. To energize lengthen inhalations and shorten exhalations.